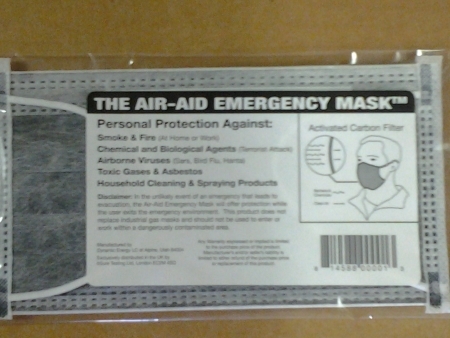 The Air Aid Mask protects you from noxious odors, chemicals, paint odors, and communicable diseases. 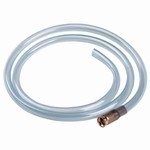 Use it while spraying with chemicals in the garden, painting, or cleaning with strong household products. The Airaid Mask was designed by a Professional Chemical Engineer that has worked as an expert in biological and chemical warfare. It uses proven technology with both bacterial and activated carbon filter stages. In the case of a biological or poisonous gas attack, the Air-Aid Mask can provide the first line of defense for those of us who don't happen to have a respirator, gas mask, or SCBA airpack immediately available. The Air Aid Mask can provide a stopgap measure to give you the extra time to exit the contaminated area. It is small and flexible enough to carry in a woman's purse, fit in a man's inside suit pocket, or to store in an office desk, car glove compartment, or any handy location. Shipped in a flat plastic package 4" x 8" x approximately 1/8" thick. Storage shelf-life is indefinite if left in sealed package. Emergency responders (police, firemen, EMTs, etc) should have one or more of these as a minimum defense against airborne agents. Every office, school, day-care center, hospital, or other institution needs a supply of these for their employees, students, customers, or patients. Purchase at least a five pack to have one or more in your car, home, and office for yourself and your family. Directions: Remove mask from package. Place mask on face with metallic strip over nose, pinching to form an air tight seal. Place the elastic loops over both ears. A Used Airaid Mask can be discarded in household or office trash. Disclaimer: The Air-Aid Mask should provide protection under normal conditions all day. In high concentration conditions, the Air-Aid Mask may provide protection for a shorter period of time. The Air Aid Mask is not intended for long term use. Anyone purposefully entering a dangerous contaminated area should use a respirator or SCBA airpack as a minimum. Answers to some frequently asked questions: The shelf life is ten years plus (if left in the sealed plastic package). The mask is a standard welded fabric medical mask that has an advanced activate carbon filter added. The mask has been tested with agents OC, CS, CN and numerous organic chemical vapors, including organo-phoshates. Its efficiency is about 95%, while a respirator is about 99.9%.